A certified electrician suffered minor burns from an electrical shock after using a non-contact voltage tester, also known as a pencil tester, to verify the presence of AC voltage. The pencil tester displayed no voltage, leaving the employee to believe the electrical circuit was safe. 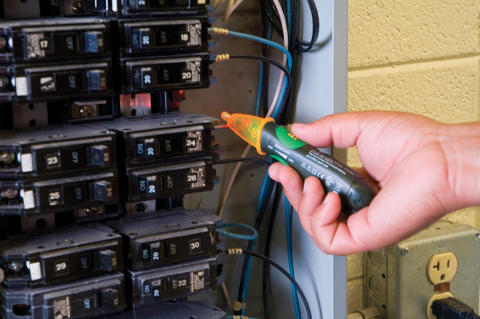 Non-contact voltage testers are important personal safety devices. They offer significant protection for anyone who may come in contact with energized electrical components. However, users must follow the manufacturer’s recommendations as well as the following recommended preventive actions. Image used with permission from Greenlee®, a Textron Company. Only use testers that comply with appropriate standards. If it appears wet, damaged or is not operating properly. For more than the rated voltage on the tester. For less than the rated voltage on the tester. Unless it is fully assembled. Verify tester operation by measuring a known voltage. Apply tester to circuit under test. Return to the known voltage to ensure proper operation. Select a tester with a high over-voltage protection. Do not assume that no voltage indication means the circuit is de-energized. Do not expose testers to extremes in temperature or high humidity. For more information contact New Brunswick’s Department of Public Safety at 506 453-3992.